One of many things that I like about going for a vacation is choosing a hotel or a B&B to stay in. Like everybody hotels used to be one of my fetish when I was a kid. You know. When you were small and you got to stayed in a beautiful hotel with pools and almost instantly you declared that is your permenant home.And also almost instantly you felt like you're some rich kid who have this home with awesome well-decored, beautiful lighting by a chandeliar dangling in the centre of a lobby and a fountain in the middle to soothe the ambient and a very nice polite pretty receptionist that I swear if I were a man I want to marry her now. And the excited feeling that you felt when the key card slot show green and immediately you went and measure the comfortness of your choosen bed by jumping on it while your mum shrieked and you snuggles instantly into the white cover. Pure bliss. When I was small I use to be very excited if my dad would allowed us to have a room service and order anything from the room service menu.Seriously. Nothing feels posh than having your english breakfast and coffee being send in by a room service and you're still in bed not brushing your teeth yet. I've always love the feeling of having a clean crisp white towel everyday and a made out bed by the end of the day when you return to your room. And because the Toblerones in the mini bar are always the forbidden ones (that's what dad says, I couldn't understands it in those days) it always seems more attractive than the ones sold at a shop. And the best you could do is buy an unattractive toblerone at the shop and switch it with the one in the mini bar. Just coz you think you got the expensive one. Haha. I'm not a fan of hostels because honestly I think the trick of having a great holiday is a great hotel to stayed in or a nice cosy ensuite B&B. They surely have a huge contributions. When you're all tired and exhausted for a whole day of walking, exploring and sightseeing, nothing beats a good night sleep and waking up fresh the next morning. So that is why everytime if you decides to have a vacation on peak holidays it's always the best to planned well ahead before everybody else so you're able to maybe grab a deal on great hotels offer. On a lighter note, have you seen the new Marina bay sands luxury hotel in Singapore? It's awesome albeit slightly odd on the concept. It's a casino hotel with a huge ship placed on top of three towers. The massive structure own by Las Vegas Sands Corp which cost a whooping £3.8BILLION to build - is billed as the world most expensive hotel. 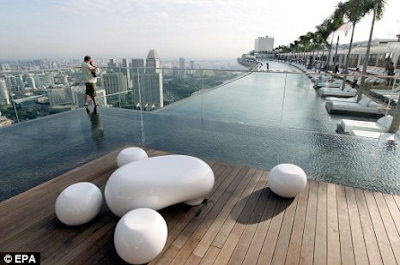 The futuristic 5 star (or maybe even 6 or 7) building boasts a spectacular "Skypark" - a huge outdoor area perched 200m (55 floor) in the air on top of the hotel, featuring a 150m "infinity" pool. The huge hotel - which dominaes the Singapore skyline - has 2560 rooms and suites, 120000 sq-meter convention exhibition centre, shopping mall, 6 restaurant, an art and science museum, 2 theatre, cinemas, 2 floating pavilions, a casino with 500 tables and 1600 slot machines. Pheww..
Thomas Arasi, president and CEO of the resort, said he expects to attract an astonishing 70,000 visitors a day - 18million a year. 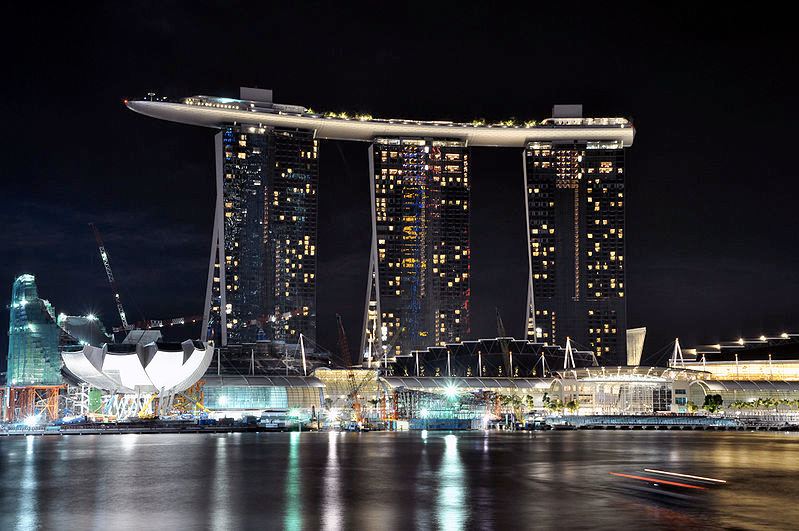 The resort was designed by Moshe Safdie, who said he based it on a deck of cards. 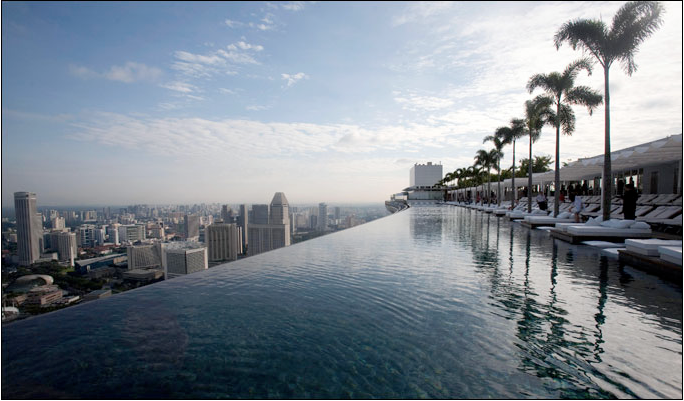 And I'm sure the water feels lovely and it's a swimming heaven for swimming pool lover to swim way up high in the sky without any boundaries. eerrr maybe..just don't look down. Fuyyyooo! Gila la hotel tu. Tapi gayat! wow that new hotel is insane!! we love to eat on hotels bed. Haha! Wait till u see how much it cost per night! It will make u start gambling haha! did you go inside and take a look?? ?